A boy named Kubo, skilled in storytelling and origami, must locate a magical suit of armor worn by his late father in order to defeat a vengeful spirit from the past. I saw this with my wife today and was amazed at the artistry and design of the film. The plot was not predictable and the fact that it was a old style stop motion made it more amazing. I like the unpredictable story ,but some smaller children may find things like the best animated skeleton since Jason and the Argonauts to be a bit alarming. Some nice behind the scenes shorts here. Extended making of and a featurette. A thing I found impressive was the sheer size of some of the sets and figures. Yes, I really enjoyed this. I mistakenly thought it was going to be claymation, which I don't usually like (though exceptions happen, like Mary and Max) but Kubo was, instead, very not-cutesy mechanical stop motion done with such skill that I only noticed it once or twice. I liked the characters and the plot was nicely non-mainstream American, though it didn't go full-on Spirited Away (more's the pity, probably). Oh, and it has the best "animated" water that I can remember seeing. Aside from a scant handful of nitpicks, I wholeheartedly recommend Kubo. I am surprised it hasn't gotten more attention- it absolutely deserves to succeed. This got reviewed in radio this week, and rated in the top 5 movies this year. Considering it comes from the same stable as Coraline and Paranormal, Pixar it is not, so it will be stuck in that adult/kid limbo. It's great on the big screen. It'll be fine on a smaller one but it's got a lot of artistic detail that might not show up so well on a small screen. Yep, this is a good flick. Wonderful visuals, good writing, great voice acting. Wait, this is actual stop-motion? I thought, from the posters, that it's CGI. 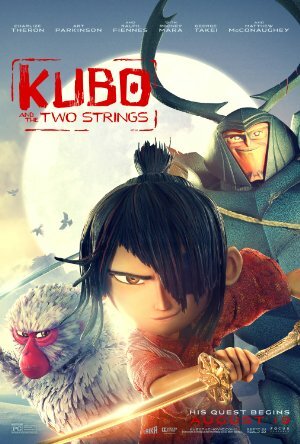 The thing that caused me to think of this as more of the same is the title: "KUBO and (the two strings)" is such an obvious franchise bid. That's possible but in the context of the story I don't think they were going for that. Kubo wasn't on a quest for two strings or anythng. Sounds like it! But the design fits right into that tradition. Kubo and the not-Harry-Potter-reference. I thoroughly enjoyed Kubo, and was surprised not a lot of folks tend to be paying much attention to the mostly sterling reviews it's picked up. It's one of those rare movies which virtually nails every category, be it story to direction. At times, it was very easy to forget that it was a stop-motion film, the M.O. of Laika, and it definitely took the short behind the scenes scene in the closing credits to remind me of what I just watched. It did have me hooked from the beginning with its nod to The Great Wave of Kanagawa with Kubo's mother fleeing in the storm. The village scenes also reminded me of a number of Samurai anime series, complete with the old woman side character. I was genuinely shocked by the mother reveal in Mr. Monkey, though it made sense, and again, a bit surprised by the father reveal in the beetle warrior. His collection of friends and heroes for his quest kind of reminded me of Journey into the West, a little as well. I really appreciated that Kubo's victory in the end didn't involve killing his grandfather, so much as forcing him to experience the humanity that he so detested (but in a caring manner). I will admit, I've had issues with some of the character designs from Laika. I enjoyed Coraline, but couldn't even finish Paranorman and still need to try and give Box Trolls another chance. Kubo didn't suffer from this same problem, and arguably, found working character designs that avoided the look or appearance of Disney or Pixar. The animation, as everyone has stated, was rock solid. I loved the tiny footprints left by paper Hanzo and the detail of the individual leaves in the ship. Before I even finished the film, I knew I'd be adding it to my movie library. It's stop motion, with some CGI and some traditional animation. Yes. Laika essentially does "stop motion plus." Which is fine by me; the end result is beautiful. I saw this last night and it was fantastic. I loved the animation, and the design, and the story was lovely. I thought it was wonderful that the conflict with the grandfather was resolved by being nice to him, by making him feel like a good person. Wish there was a lot more of that in the world. What a lovely movie. I really enjoyed it, and I was glad there were lots of families at the afternoon showing I attended. Parts of it I would have been terrified by at age 5, but no children fled the theater, so I guess kids today are tougher than I was as a child. The mother's sisters were seriously creepy. It reminded me more than a little of Avatar: The Last Airbender, especially the ending. One of the five or ten best movies I have ever seen. Awesome. I thought the entire thing was CGI, didn't know it was the same studio that did Coraline. I really liked the whole movie, one of my favorites for sure. I saw one of the last screenings in my city; I've been crazy busy but I knew this was one I had to see on the big screen. The artistry ranged from masterful to downright unbelievable, but for me though the story worked overall and some of the dialogue was quite beautiful, at other times it fell a bit short. I liked Art Parkinson as Kubo but didn't love a lot of the other voice actors. The themes were quite similar to those in The Tale of Princess Kaguya, so it was interesting to compare them. But the Tale of Princess Kaguya felt a bit more centered, while Kubo and the Two Strings felt a little more all-over-the-place, tackling several different issues other than what I felt was the main theme. I hope that during awards season it gets the recognition that it certainly deserves, despite its low box office numbers. Despite my nit-picking, this is a better animated movie than Zootopia, and far better than any other animated movie so far this year. Loved it. It was beautiful and had a lovely story that was well paced. If you have a chance look out for any of the making of videos going around, they are incredible. I didn't love Matthew Mcconaughey as the beetle, but it didn't diminish the film at all for me. My kid and I saw this in a nearly empty theater and couldn't help but keep looking around asking "Where is everybody? THIS IS AWESOME." This is probably the best under-the-radar kids' film since Iron Giant. One of the things that is amazing about Kubo is how the theme is basically that your mom and dad are going to die some day, but they put so much of their love into you that they can guide you anyway and you will be okay. That is positively stunning in a kids' movie.